Last year’s count last decade and continue to grow with consumer demand for was up more than larger cruise ships and more frequent cruises,” Matt Gresham, 2.6 percent from spokesman for the Port of New Orleans said last month. 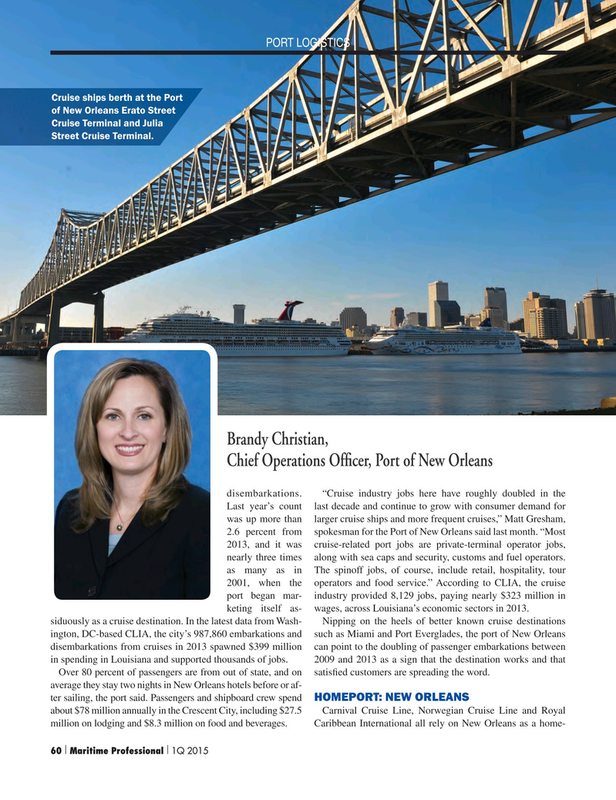 “Most 2013, and it was cruise-related port jobs are private-terminal operator jobs, nearly three times along with sea caps and security, customs and fuel operators. as many as in The spinoff jobs, of course, include retail, hospitality, tour 2001, when the operators and food service.” According to CLIA, the cruise port began mar- industry provided 8,129 jobs, paying nearly $323 million in keting itself as- wages, across Louisiana’s economic sectors in 2013.